Contrary to popular belief, building a website for your small business isn’t just about getting more sales but the idea behind an online presence goes deeper than that to brand development and brand loyalty. However, small business owners are still not sure about having a professionally developed website. Following are some reasons why your business needs a website. That is one of the most important aspects of having a professionally developed website. We all know how everyone uses internet to search services and products on the internet. 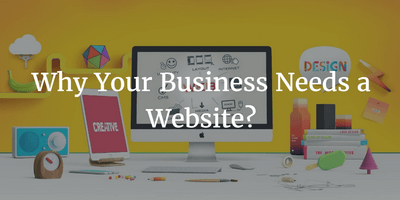 Having a website would give your business credibility. Otherwise your potential customers would go to your competitors. Credibility is not just about having an online presence but “home-made” website would be significantly different than a professionally made website. A website saves you money. This might seem counterintuitive as developing a website would need initial investment but considering the impact of a website on your customers and how it would help you in brand development, marketing, advertising and increasing customer loyalty, it is a much cheaper option. With a website, you can reach global market and customers all over the world. Now compare the cost with other marketing channels to advertise your business globally. Unless your business is highly services based, chances are it works during specific business hours. This could be a problem for your international clients with different time zone. With a website, you can provide 24/7 access to your customers all over the globe so they can check out your services, products and other information. Traditional marketing and advertisement media are bound by geographical boundaries. You can access your target audience in a specific location but websites have no boundaries. You can sell your products and services to a much wider market without worrying about the distances and geographical differences. Depending on the nature of your business, your website can work as your online portfolio. For example, if you are a B2B business (wholesale business) then you can use your website effectively to showcase your products. Other than the products, you can also show your previous projects, testimonials and tell your customers how your business and products are unique. The world is a global village now and customers expect businesses to have a professionally developed websites. As mentioned above, everyone uses internet to find relevant information about the services and products they want. That’s where your online presence via a well developed website can make a huge difference. Websites provide amazing ROI (Return of Investment) as compared to other marketing and advertising channels. A professionally developed website combined with some SEO (Search Engine Optimization) efforts can help you get more customers and more sales. Organic traffic refers to the visitors and potential buyers coming to your website without spending any money on advertisement and marketing. Depending on the contents of your website, how it is developed and some other factors, it would appear on Google, Bing and Yahoo search results that would help you increase your sales. By superadmin| 2017-02-21T15:26:22+00:00	January 27th, 2017|Categories: Beginner, Ecommerce, Marketing, Web Development|Comments Off on Why Your Business Needs a Website?